Falconets off to Austria ahead of under-20 women World Cup – Royal Times of Nigeria. 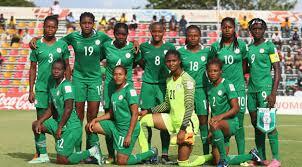 The National Under-twenty female team, the Falconets will depart the country on Friday aboard Air France for Austria, for a two-week training tour ahead of the FIFA Under-twenty women World Cup in France. The team, which has been in camp in Abuja, is expected to fine-tune its preparations for the Under-twenty women World Cup in Austria by playing some friendly matches with some local teams. The Christopher Danjuma-tutored side will travel with twenty-five players, while four of them will be dropped after the camping exercise in Austria before the team departs for France, venue of the championship. The Falconets will depart Austria for France, venue of the Under-20 women world Cup on August second, for the championship, which runs form the fifth to the twenty-fourth of August. Nigeria has had an impressive record at the championship finishing second twice in 2010 in Germany losing to the host zero-two and 2014 in Canada again to Germany zero-one and fourth in 2012 in Japan when we lost to Japan one-two but failed to make it beyond the group stage in 2016 in Papua New Guinea.